January 2014 – Under Every Leaf. 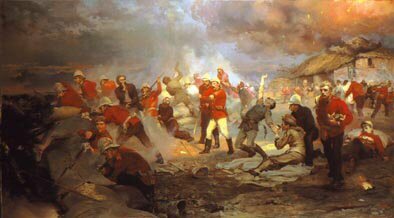 As dawn broke on the morning of the 23rd January 1879 the defenders of the British outpost at Rorke’s Drift surveyed a scene of devastation. The ground in front of them was scattered with the broken bodies of their Zulu attackers, the charred remains of the hospital smouldered, sending drifting clouds of smoke across the battlefield. The men were mortally tired and thirsty, they had stood to all night, the last frontal assault had occurred at 9.30pm but sporadic gun fire had carried on until 4.00am. As light broke across the surrounding hills, sending strange shadows across the outpost, Lieutenant Bromhead lead a team of men across Enemy Territory to rescue the water barrel. As fears of another assault receded, Chard and Bromhead kept the men busy by rebuilding the defences, collecting the British dead and collecting the weapons of their fallen enemy. It is said that they collected 100 rifles and 400 assegais from in front of the barricades. The men were bone tired and bruised from the constant firing of their Henri-Martini rifles. They had fired almost 25,000 rounds in 5 hours of fighting, at 42 rounds a minute that was going to leave some sore shoulders in the morning. As it became more and more likely that they had survived their ordeal the atmosphere within the outpost become almost joyous, although as hospital cook, Henry Hook just got on with making tea for the patients. 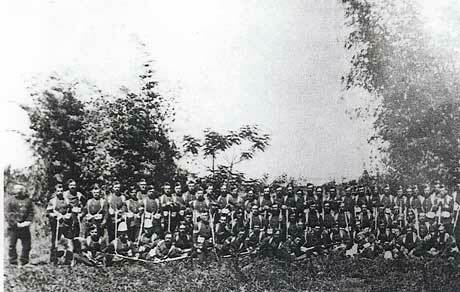 At 7.00am the mood in the camp slumped drastically as a column of Zulus were seen in the hills above the outpost. The stand to was called and the patrols and work parties came rushing back but the Zulu column had no stomach for a fight, it was only interested in making it back to Zululand. At just after 8.00am joyous shouts broke out on one side of the camp as the advance scouts of Lords Chelmsford’s column came into view, unbelievably and against all odds, Rorke’s Drift had been held. Chard was born in Boxhill on the 21st December 1847 and he joined the Royal Engineers after passing out of the Royal Military Academy Woolwich in 1868. He served in numerous postings including Chatham, Bermuda and Malta but had never seen action. In January 1879 he arrived in the Cape for the beginning of the 9th Frontier War. He was attached to Lord Chelmsford’s invasion column and was left at the River crossing below the outpost at Rorke’s Drift to supervise the ponts there. On the morning of the 22nd January, Chard travelled up to the main British camp at Isandlwana for orders but was sent back to the river as he wasn’t needed thus missing the slaughter there by about half an hour. 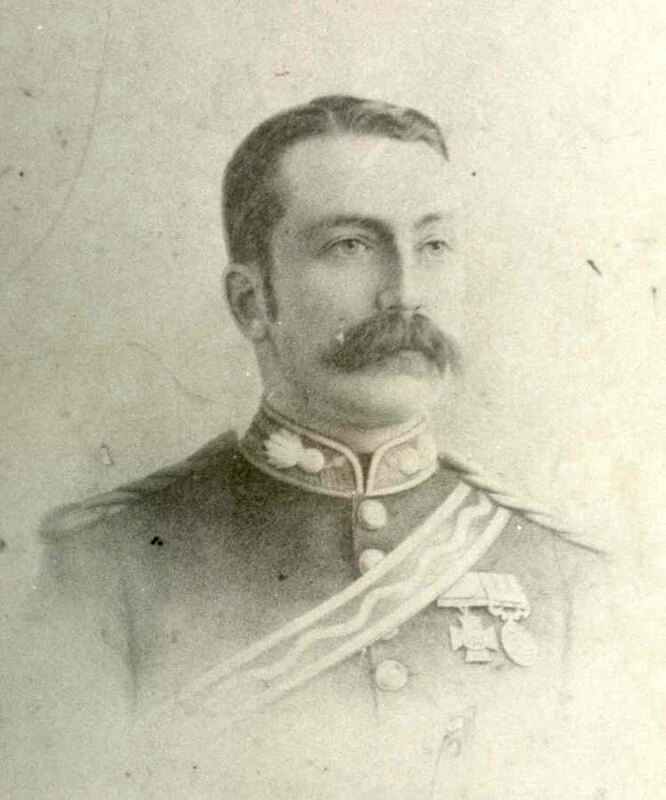 On account of him being the senior lieutenant at Rorke’s Drift, Chard is in command when the Zulus attacked and for outstanding leadership during the battle he was awarded the Victoria Cross. 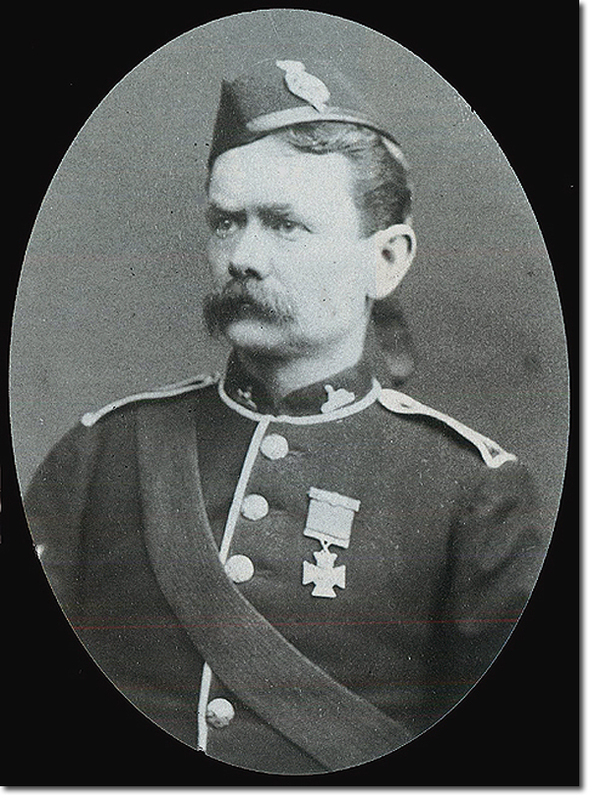 After the battle, Chard contracted a fever so was sent back to Ladysmith to recover, he was promoted to Major and was present in South Africa for the rest of the war and was present at the Battle of Ulundi. His VC was presented to him by Lord Wolseley and he arrived back in England in October 1879. As mentioned yesterday he received an invitation to Balmoral to meet Queen Victoria and he became a firm favourite of hers. He served in the Royal Engineers for the rest of his life but never saw action again. He was promoted to Colonel but while in Scotland he was diagnosed with terminal cancer of the tongue. He suffered terribly in the last months of his life, enduring numerous operation to remove his tongue and finally died in Taunton on the 1st November 1897. He was buried with full military honours and the Queen sent a wreath bearing the inscription “A mark of admiration and regard for a brave soldier, from his sovereign” This was placed on his coffin and buried with him. The Duke of Connaught and Lord Chelmsford both sent letters of sympathy and a fine marble cross was erected above his grave. His whereabouts of his VC are not know but his family have a replica. Henry Hook was born in Alney near Gloucester on the 6th August 1850. He had served in the local militia for 5 years before enlisting in the regular army in 1877. He travelled to South Africa with the rest of his battalion and took part in the 9th Frontier War. He was present at Rorke’s Drift and was posted in the hospital during the battle. For his actions in the hospital, including saving many patients when it fell, Hook was awarded the Victoria Cross. 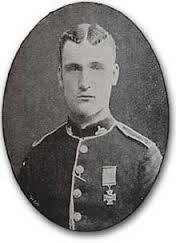 Hook served at Rorke’s Drift for the entire war and is one of the few men to receive their medal at the sight of winning it when Lord Wolseley presented it him there. In 1880 Hook decided to buy himself out of the army at a cost of £18 but when he returned home he found that his wife had believed he had been killed so had sold his home and had remarried. Hook moved to London and with the help of references from Lord Chelmsford and Major Bromhead VC secured a job as cloakroom attendant at the British Museum. He remarried and served part-time in the 1st (Volunteer) Battalion of Royal Fusiliers. In later life he was plagued by ill-health so retired to his native Gloucestershire where he received a heroes welcome. He died of Tuberculosis on the 12th March 1905. His funeral was a lavish affair with 24 different regiments represented. His pall Bearers were provided by the South Wales Borderers (including Corporal Hitch, Son of his old colleague Fred Hitch VC). 18 months after his funeral a marble memorial was erected above his grave. His VC is in the regimental museum in Brecon. Henry Hook’s life was much maligned by the film Zulu which cast him as a drunk and a malinger. This was about as far from the truth as you could get. Hook was a teetotaler and a respected soldier who left the army with numerous good conduct medals. His daughter was so disgusted by his portrayal in the film that was walked out of the premiere in 1964. William Jones was born in Bristol in 1839. Originally he worked in the footwear business but enlisted in 1858. He served in Mauritius and Burma (where he was promoted to Corporal and then reduced in Rank) He sailed to South Africa with the rest of his regiment and his pregnant wife. While serving in the Frontier war his wife became ill during childbirth and he was giving leave to look after her but unfortunately she died not long after and after burying her he returned to his regiment. For his conduct at Rorke’s Drift he was awarded the Victoria Cross but almost immediately was found to be suffering Chronic rheumatism and was sent homey in September 1879. He was presented his VC by Queen Victoria herself in January 1880 but was medically discharged from the Army in February 1880. It is believed that he toured with Buffalo’ Bill’s Wild West show and appeared on stage to recount his story. He soon fell on hard times and was forced to Pawn his VC for £5 and then sold the pawn ticket. 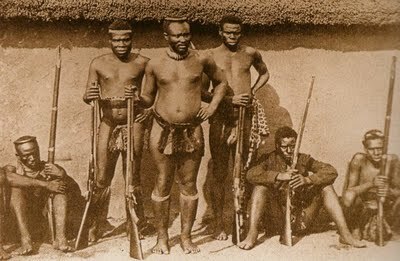 In later life he started to become senile and would become distressed by the thought of Zulus attacking him and would sometimes become so terrified that he would flee the house carrying his infant Grand-daughter in his arms. On one occasion he disappeared completely and was found in the local workhouse unable to remember his name. He died on the 15th April 1913 and this most tragic of heroes was buried in a public grave with no mention of his deeds or VC. In 1983 a VC engraving was added to common head stone but repeated attempts to erect a suitable memorial have failed. His VC turned up in the 1930’s and is now in the Regimental museum Brecon. Robert Jones was born in Monmouthshire on the 19th March 1857. He was a farm labourer like his father and defied his father’s wishes by enlisting in January 1876. 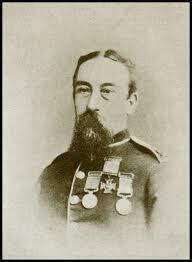 For his actions at Rorke’s Drift he was awarded the Victoria Cross and he was presented his medal by Lord Wolseley. 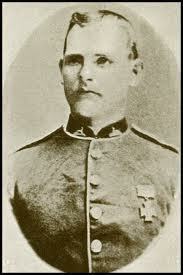 He served throughout the Zulu war and ended the war with one bullet and four assegai wounds. He then served in Gibraltar and Secunderabad in India for ending his service as a reservist at Brecon. He finally left the army in 1888 and with his wife moved to Hereford. He found work as a labourer but one of his wounds had been close to his eyes and in later life this caused him to suffer painful headaches. In August 1898 he collapsed at work and his wife remarked he was never the same again. In September 1898 she noticed him acting strangely before he headed of to work. While at work he borrowed his employers shotgun and two cartridges, went into the garden and put the gun into his mouth and pulled the trigger. The jury at his inquest decided that he had been temporarily insane and returned a verdict of Suicide while of unsound mind. His VC is the only one of B’ Company that is still in the hands of a private collector. Private John Williams (AKA John Fielding) B Coy, 2nd Bn, 24th Regt. John Fielding was born in Abergavenny on the 24th May 1857 and was a worker at the Nut and Bolt Factory. After enjoying his time in the Militia he decided to join the Regulars in May 1877. He received his VC from General Anderson in March 1880 and was then posted to India. He returned home in 1883 and was transferred to the Reserve soon after. He was discharged from service in 1893 but served as a civilian at Brecon until he retired in 1920 (His eldest son was killed in the Great War whilst serving with the South Wales Borderers). In 1920 he attended a Garden party for holders of the VC and hosted by King George V and Queen Mary. He died of heart failure on the 24th November 1932 and was buried with full military honours at the local RC church. His VC is in the Regimental museum Brecon. William Allen was born in Newcastle-upon-Tyne in February 1844. He enlisted in 1859 and was posted to the 24th Regiment of Foot. He served in Mauritius and seems to have been a poor soldier as he was confined to cells on numerous occasions but re-engaged in 1873 and was posted to the regimental deport in 1874. He seems to have enjoyed his time their as he is promoted to Corporal and was appointed assistant schoolmaster.. He sailed to South Africa with his regiment in 1878 and was promoted to Lance-Corporal in May 1878 but by October 1878 his back to Corporal. He was a prized shot and won a Good Shooting and Distance Prize. For his actions at Rorke’s Drift his was awarded to Victoria Cross. During the battle he was badly wounded in his arm and he was invalided back to Britain in 1879. He received his VC from Queen Victoria at Windsor and was back serving in 1880. He was posted to Colchester and in June 1880 was promoted to Sergeant and in 1886 was posted to the School of Musketry in Monmouth. In all he had eight children and became a popular and well liked man in the town. In 1890 an influenza epidemic hit the town and Sergeant Allen became a victim on the 12th March 1890. He was buried with full Military honours and a stone cross was placed over his grave. This post has been about the eleven winners of the Victoria Cross won during the action at Rorke’s Drift 22/23rd January 1879 and while we should celebrate them we should also remember the brave men of the Zulu Impis who died defending their homeland from the largest and richest empire in History. And the temple of his gods. 22nd January 1879 and for the 150 men at a remote border post on the Buffalo River, Natal the day seemed like any other. A single company of the 2nd battalion 24th Regiment of foot guard the outpost and the few dozen recuperating hospital patients. Many feet aggrieved that they were not part of the main invasion column that had entered the Zulu territory a few day before. Under the command of the affable Lieutenant Gonville Bromhead, the men went about their normal duties unaware of the storm that was approaching them. The first inkling of trouble is when gunfire reverberates around the hills surrounding the outpost. Their worst fears are confirmed when a panicking group of Colonial horseman ride up to the outpost and inform them that the British have suffered a catastrophic defeat at Isandlwana and their parent battalion has been wiped out. The Horseman refuse to stay at the outpost and inform them that a large Zulu Impi is on its way to wipe out the garrison. At this point a Royal Engineers officer by the name of Lieutenant John Rouse Merriot Chard takes command of the outpost. Chard narrowly missed out at being at the slaughter of Isandlwana and is determined to hold Rorke’s Drift at all cost. He knows they are the only thing between the Zulu army and the civilian population in Natal. For Prince Dabulamanzi, Brother of King Cetshwayo, being in reserve during the battle of Isandlwana hadn’t satisfied his burning ambition and with a young regiment desperate to wash their spears with blood, the few defenders at Rorke’s Drift are a tempting target . Even though he is disobeying his brother’s orders not to attack fortified places and with darkness approaching he sends his Impi up against the defenders of Rorke’s Drift. What followed next has entered British Military folklore (for anyone not familiar with it I highly recommend ‘Like Wolves on the Fold’ by Mike Snook) and thanks to the film Zulu (1964) a stirring if highly inaccurate film it has also entered mainstream conciseness. For the British Government at the time the successful defence of Rorke’s Drift by 150 men (some sick) was a useful distraction form the disaster at Isandlwana and as such awarded 11 Victoria Crosses to the defenders, the most awarded for a single action. To commemorate the 135 anniversary today (and tomorrow) I wanted to track what happened to the eleven VC winners after the battle. Acting Assistant Commissary James Langley Dalton. Army Commissariat & Transport Department. James Dalton had been in the military for most of his adult life. He joined the 85th Regiment in 1849 at the age of 17 and then enjoyed a typical career of a soldier in Imperial service. He served in Ireland, Mauritius, where he was promoted to Sergeant and then went to the Cape to take part in the 8th Frontier War. He then spent a portion of his time in England including a spell at the School of Musketry at Hythe in Kent (we will return there again). His last posting overseas was to Canada where he transffered to the Army Service Corps. He took his discharge in London in 1871 and was awarded the Long Service Good Conduct Medal. In 1877 he volunteered for service in South Africa and the invasion of Zululand. He was appointed Acting Assistant Commissary and sent to the outpost at Rorke’s Drift to ensure the smooth transport of supplies from Natal to the invasion force. For his actions at Rorke’s Drift he was awarded the Victoria Cross and was presented his medal by Major-General Clifford in January 1880. He was also given a permanent commission and promoted to Assistant Commissary. He served as a volunteer in Egypt before returning to the Cape to gold mine in the Transvaal. He died suddenly at the Grosvenor Hotel on the night of the 7th January 1887. His VC is owned by the Royal Corps of Transport who brought his medal for £62,000. James Reynolds was born in Dublin 1844 and studied medicine at Trinity College, graduating in 1867. He joined the Medical Staff Corps in 1868 and was posted to the 36th Regiment as Medical Officer in 1869. He served in India and for his efficient handling of a Cholera outbreak was promoted to Surgeon in 1873. 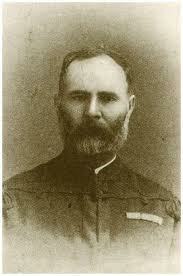 He served thoughout the Zulu War and was in charge of the Hospital at Rorke’s Drift. 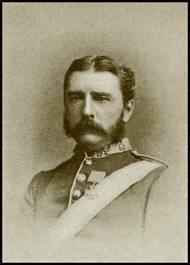 For his actions at Rorke’s Drift he was mentioned in Dispatches and awarded the Victoria Cross. He was presented his medal by Lord Wolseley during a special parade and was promoted to Surgeon-Major. He continued serving in the army and married his wife in 1880. He retired a Brigade-Surgeon Lieutenant-Colonel in 1896 and senior medical officer at the Royal Army Clothing Factory. Both him and John Williams VC were guests of Honour at the VC’s dinner hosted by the Prince of Wales in 1929. He died in a nursing home on the 4th March 1932 and is buried at Kensal Green RC Cemetery. Gonville Bromhead was a classic army officer of the 19th Century. He was third son of a Baronet who was a lieutenant at Waterloo and had retired as a major. He was purchased an ensigns commission in the 24th regiment of foot on the 20th April 1867. A hugely popular officer he excelled at Boxing, wrestling and Singlestick. He was promoted to lieutenant in 1871 and went with his regiment to South Africa for the 9th Frontier War. 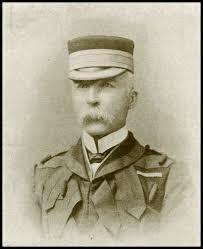 He was in command of B Company 2nd Battalion 24th Regiment of Foot at Rorke’s Drift but was superseded by Lieutenant Chard RE for overall command of the Outpost. For his conduct and coolness during the attack, Bromhead was mentioned in dispatches and awarded the Victoria Cross. 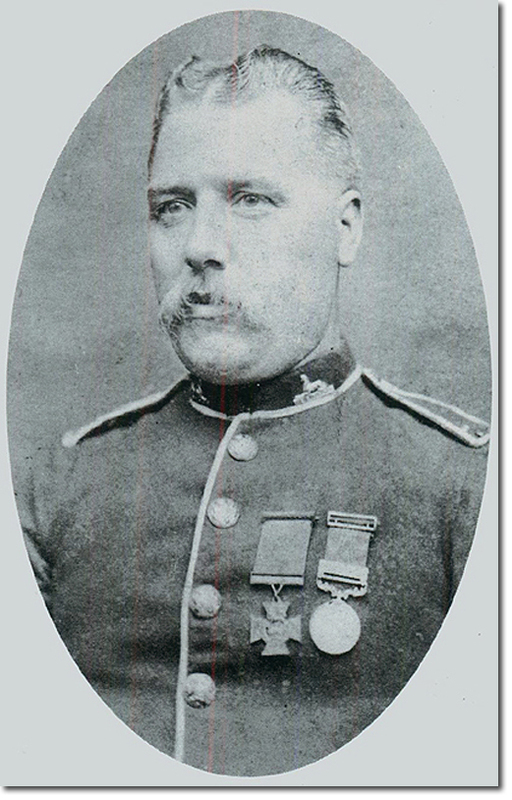 He received his medal from Lord Wolseley in 1879 and was promoted to Captain. What followed was again the classic career of a British Officer. He was posted to Gibraltar in 1880 and then posted to the East Indies until 1881. In 1882 he was posted to the Hythe School of Musketry (another one!) and was awarded a First Class certificate. In 1883 he was promoted to Major and then joined the South Wales Borderers in India. He served with distinction in the Burmese Campaigns 1886-88. He died of enteric fever in Camp Dabhaura, Allahabad on the 9th February 1891. His VC is in the Regimental museum, Brecon. A side story is that both Bromhead and Chard were invited to an audience with Queen Victoria, unfortunately Bromhead was fishing in Ireland when his invitation was delivered so missed the audience. While Chard remained a firm favourite with the Queen, Bromhead was never invited again. Friedrich (real name Ferdnard) Schiess was a Swiss national who served in the Colonial cavalry during the 9th Frontier War. He was born at Berne in Switzerland in 1856 and when only 15 served on the French side during the Franco-Prussian war. A some point he arrived in South Africa and joined Lonsdale’s Horse, one of the main Colonial militia’s forming for the Invasion of Zululand. Schiess was in hospital at Rorke’s Drift due to blisters caused by army issue boots. For his actions during the defence of the outpost he was awarded the Victoria Cross (the first man serving with South African Forces under British Command). He was presented with his medal by Lord Wolseley . After the war he was employed in the Telegraph Office at Durban but for some reason lost his job. Despite desperate appeals for work he soon became destitute and was found on the streets of Durban ill and dishevelled. The Royal Navy took pity on him and offered free passage to England which Schiess took up. He boarded the troopship Serapis but was too sick to survive the journey and died on the 14th December 1884. He was buried at sea of the coast of Angola. His VC was forwarded to the War Office where is sat in a drawer for many years before being presented to the National Army Museum. He was sent to South Africa with the rest of the 24th Regiment of Foot and was in B Company at Rorke’s Drift. During the action Hitch shot in the shoulder and despite the agony he must of been in continued to offer support and ammo to his fellow soldiers. For his actions at Rorke’s Drift Hitch was awarded the Victoria Cross. Surgeon Reynolds removed over thirty pieces of bone from Hitch’s shoulder and inevitably he was invalided out of the army. He received his medal from Queen Victoria in Person while recuperating at a Military Hospital in Southampton. In 1880 he married his wife Emma and went on to have 6 children with her. He worked for many years at the Imperial Institute and the Royal United Services Institute where he famously had his VC cut from his coat. In later life he became a cab driver in London and was a popular sight on the streets of London. He lived quietly in Chiswick but died of Heart failure on the 6th January 1913. He was buried with full military honours in Chiswick Old Cemetery, two of his Pall Bearers were John Fielding VC and Frank Bourne DCM and over 1000 cab drivers attended. A myth of his funeral is that during it you couldn’t get a cab anywhere in London, which is true but only because they were all on strike at the time! Hitch’s VC was recovered after his son paid £85 at a public auction for it, it now resides at the Regimental Museum Brecon. Tomorrow I will cover Lieutenant Chard, Privates William Allen, Henry Hook, John William, Robert Jones and William Jones.